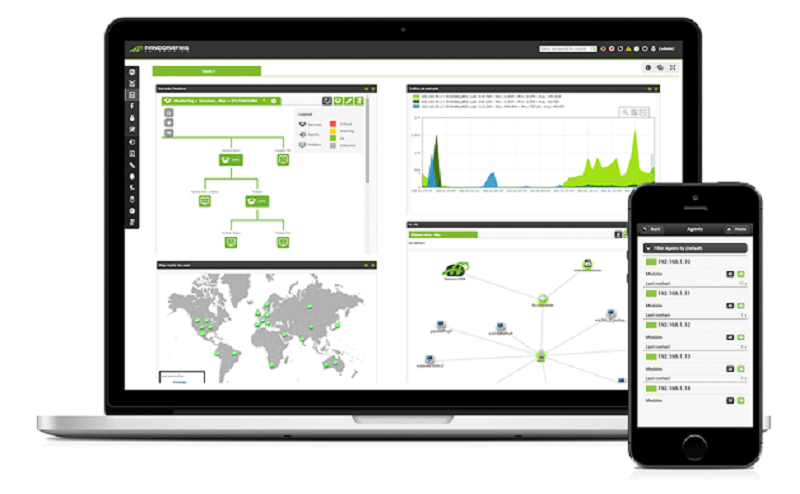 Nagios is an amazing Open Source monitoring tool which provides you pretty much comprehensive monitoring environment to always keep an eye on your all Workstations, Servers and Network devices whether you want to monitor a data center or just a small business server room. 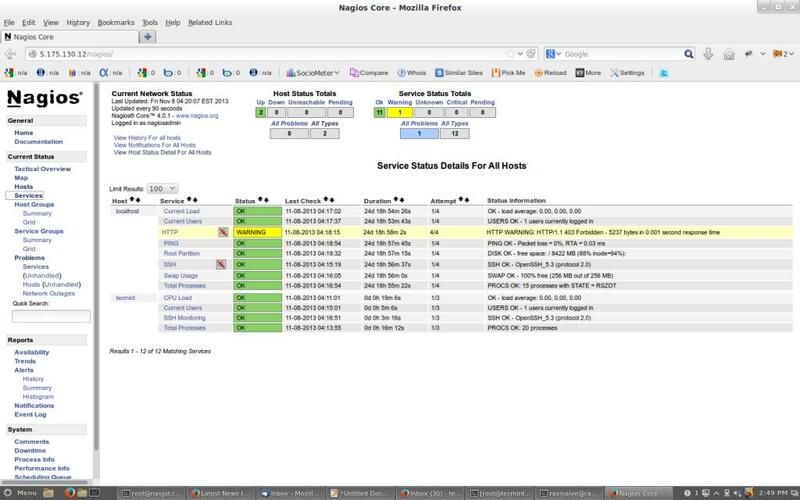 Using Nagios, you can monitor network enabled devices and their services remotely on a single window. It shows warnings and alerts if something goes wrong within on premises datacenter or DR Site which eventually helps us to predict failure before they occur. It also help us to reduce downtime during peak business hours. Recently, Nagios released its latest versions of Nagios 4.2.0 and its latest stable release of Nagios plugins 2.1.2 on August 01, 2016. This Nagios Guide with step by step instructions on how to install latest Nagios 4.2.0 from source (tarball) on RHEL 7.x/6.x/5.x, CentOS 7.x/6.x/5.x and Fedora 24-19 distributions. The below steps was performed on CentOS 7.2 Linux distribution during the time when this particular article was being written. If you follow below mentioned guideline correctly, you will end up with following information. You need to install prerequisites Apache, PHP and some libraries like gcc, glibc, glibc-common and GD libraries and its development libraries before installing Nagios 4.2.0 using source. To install these packages, you can use yum default package installer. If you are on Fedora then use the following command. Now add both the nagios user and the apache user to the nagcmd group. Now download latest Nagios Core 4.2.0 and Nagios plugins 2.1.2 packages with wget command. First we will configure Nagios Core. We need to go to Nagios directory and run configure command with required prefix as show below. Your nagios is ready to work, please open it in your browser with “http://server-ip-address/nagios” or “http://hostname/nagios” and Provide the username “nagiosadmin” and password. Here we have successfully installed and configured Nagios and its Plugins and its ready to monitor your network enabled devices. 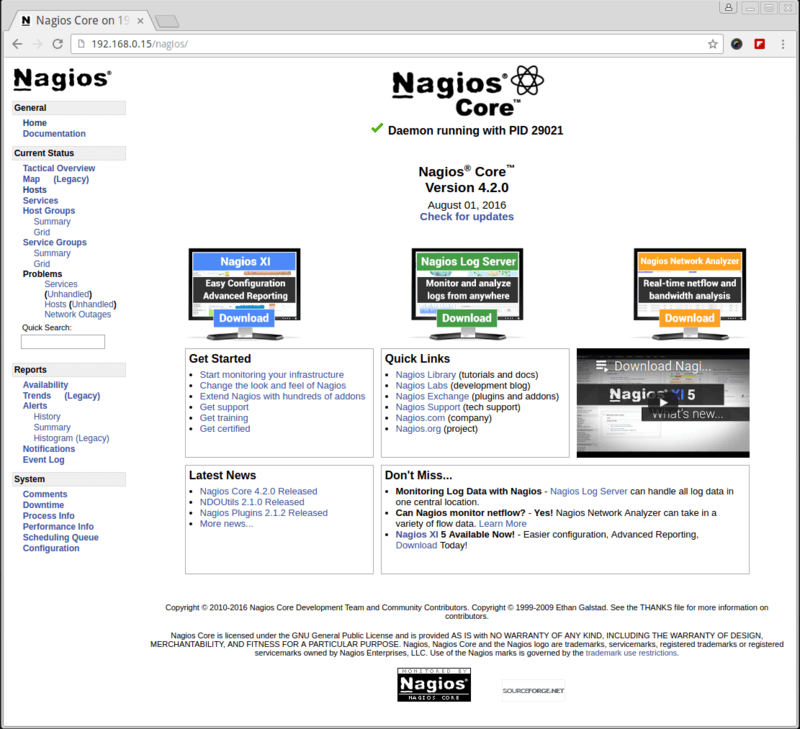 If you are already running an older version of Nagios, you can upgrade it anytime. To start upgrade process, you just need to download the latest tar archive of Nagios and configure it through the following commands. 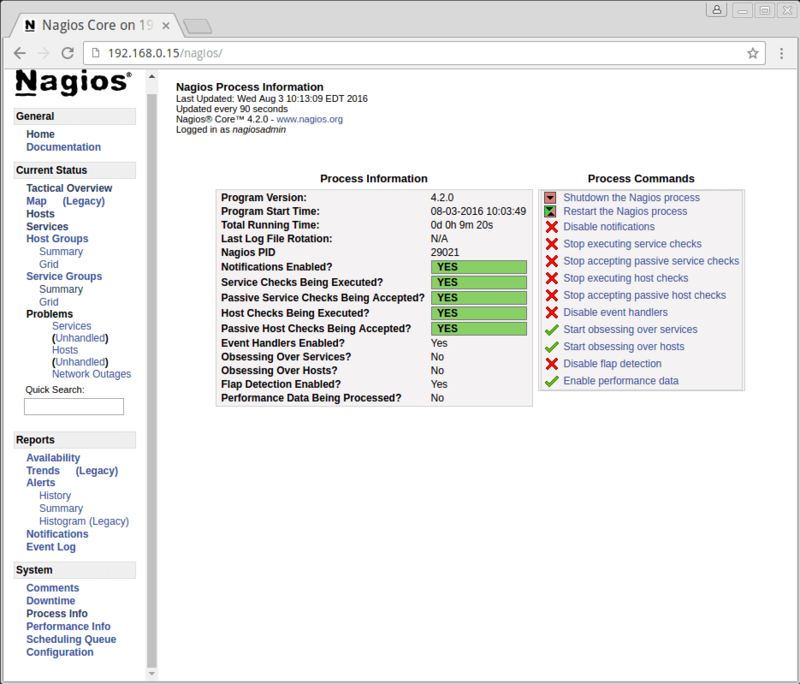 We have completed Nagios installation and configuration process. 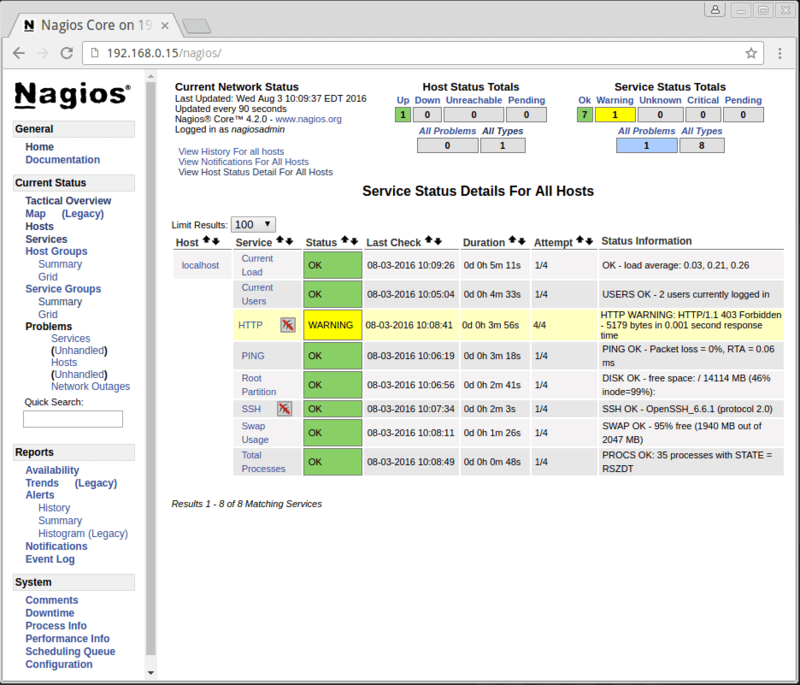 Now I'll walk you through the steps to add Linux, Windows, Printers, Switches, Routers, Firewalls and other network enabled Devices to your Nagios monitoring Server. Nagios Remote Plugin Executor (NRPE ) allows you to monitor any remote Linux/Unix services or network devices. 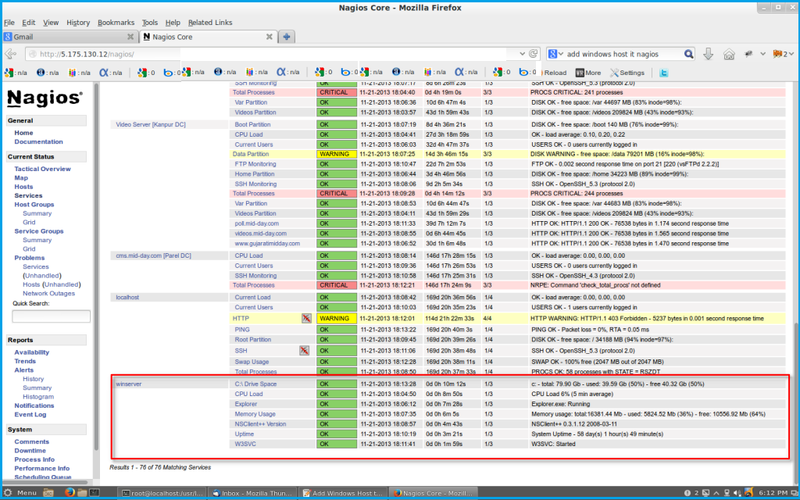 The NRPE add-on allows Nagios to monitor any local resources like CPU load, Swap, Memory usage, Online users, etc. on remote Linux machines. These local resources are not mostly exposed to external machines, so that NRPE agent must be installed and configured on the remote machines. To use the NRPE, you will need to do some additional tasks on both the Nagios Monitoring Host and Remote Linux Host that the NRPE installed on. I will be covering the both installation parts separately. I assume that you are installing the NRPE on a host that supports TCP wrappers and Xinted daemon installed on it. Most of the modern Linux distributions have these two installed by default. If not, we will install it later during the installation when required. Please use the following instructions to install Nagios Plugins and NRPE daemon on the Remote Linux Host. Run the following tar command to extract the source code tarball. tar -xvf nagios-plugins-2.1.2.tar.gz After, extracting one new folder will appear in that directory. Download latest NRPE Plugin 3.0 packages with wget command. You can edit and add new command definitions by editing the NRPE config file. Finally, you’ve successfully installed and configured NRPE agent on the Remote Linux Host. Now it’s time to install a NRPE component and add some services on your Nagios Monitoring Server. Now go to Nagios Monitoring Web interface at “http://server-ip-address/nagios” or “http://hostname/nagios” and Provide the username “nagiosadmin” and password. Check that the Remote Linux Host was added and is being monitored. 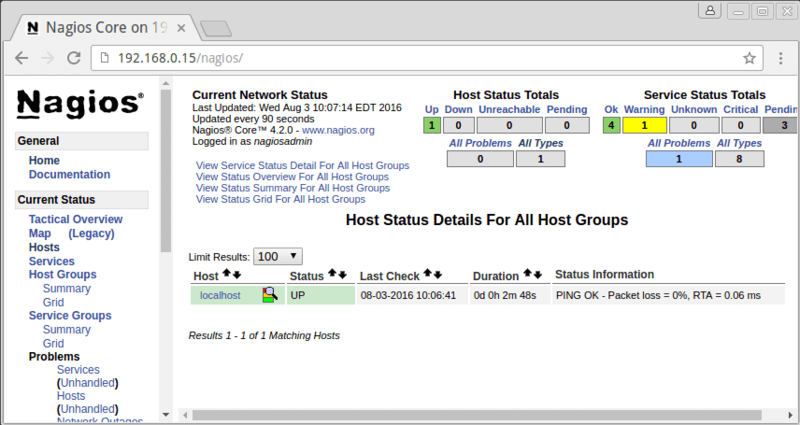 Now, in the next step I'll be showing you how to add Windows host to Nagios monitoring Server. To add and monitor a Windows Machines you will have follow the below mentioned guideline. 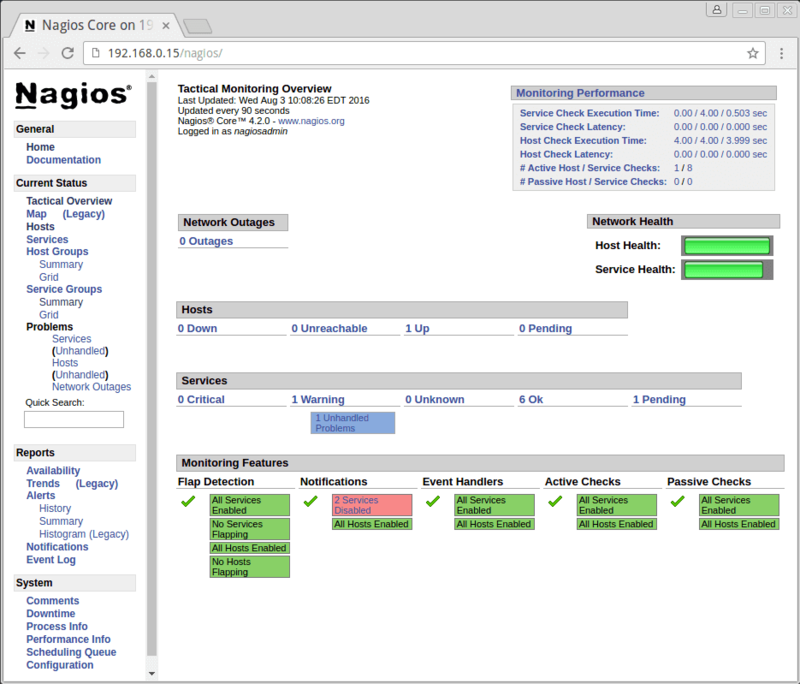 To make this pretty simple and easier, a few steps of configuration we have already done in the Nagios installation. These two files “command.cfg” and “templates.cfg” files can be found at /usr/local/nagios/etc/objects/ directory. You can modify and add your own definitions that suits your requirement. 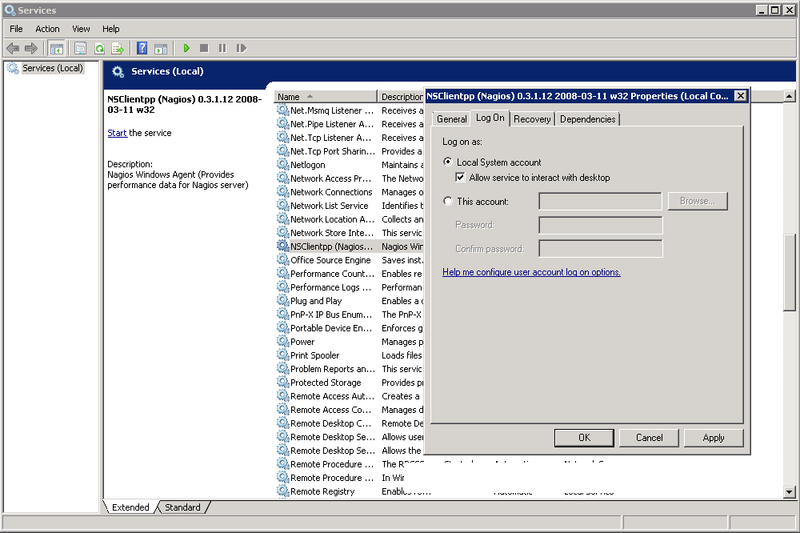 Go to the Windows Services Manager and right click on NSClient go to Properties and then ‘Log On‘ tab and click the check box that says “Allow service to interact with the desktop“. If it isn’t already allowed, please check the box to allow it to. Now go to Nagios Monitoring Web interface at “http://server-ip-address/nagios” or “http://hostname/nagios” and Provide the username “nagiosadmin” and password. Check that the Remote Windows Host was added and is being monitored.